With soybean production valued at over $1 billion, keeping pests away from soybeans and on people’s plates is a top priority for the Mississippi Agricultural and Forestry Experiment Station. Dr. Te-Ming Paul Tseng, MAFES scientist and assistant professor in the College of Agriculture and Life Sciences’ plant and soil sciences department has partnered with Dr. Marcus Lashley, MAFES scientist and assistant professor in the College of Forest Resources’ wildlife, fisheries and aquaculture department to use precision agricultural tools to protect the crop from pests. 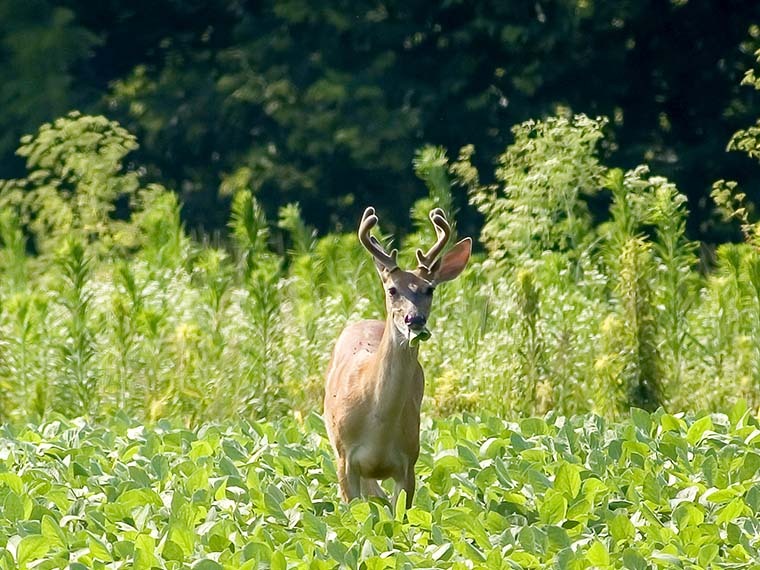 Soybeans are a well-known favorite of white-tailed deer, whose browsing during early plant establishment can damage yields. Traditional repellents, such as fencing or chemical repellents are expensive and ineffective. Instead of going the traditional route, Lashley and Tseng turned to nature for new ideas. To find natural ways to combat pests, they turned to the forest ecosystem, and looked for plant species that pests tend to leave alone. They then extracted the compound that deterred animals from the plant, which they are now in the process of patenting. “The idea was to use a plant’s defenses to defend plants. This is a unique idea in the pest management world and we’re excited about the possibilities,” Lashley stated. To aid with the process of protecting soybeans specifically, they found a plant that was closely related to the cash crop, but considered a weed due to its lack of edibility for wildlife, insects, and humans. “This compound works because it has a very distinctive smell, and also causes digestive upset. So the animal will try the plant once, and then associate feeling sick with the smell of the plant,” Tseng explained. The team tested this theory by bringing treated and untreated soybeans out to the Forest and Wildlife Research Center’s Johnie R. Dawkins Memorial Deer Unit, to try them out on the resident, penned deer. “The first time we laid the soybeans out for them, they browsed all of them equally—both the treated samples and the untreated ones. But the second time we brought samples out, they wouldn’t touch the treated samples, and only browsed the untreated ones,” Lashley said. The researchers believe that while deer might initially browse treated soybeans in the wild, after they learn to associate the smell with digestive upset, they will no longer touch treated crops. While at the moment they are focused on four-legged pests, the compound might also dissuade insects. “Our experiment is set up so that there are multiple layers of protection for the soybeans—in some treatments they are accessible to everything. In others, they are accessible to insects but not deer. And in the last treatment we have insect netting and exclusion fencing up, which will discourage all pests,” Tseng said. This set up will allow the researchers to record data on exactly how much each pest impacts soybean yields, and whether treatments of their compound dissuade both hoofed and winged pests. “Before it goes on the market, we want to make sure that it works better than the other products out there, and that it doesn’t harm yield itself,” Tseng stated. While the compound can be easily applied to plants, researchers are unsure how long it will persist once it has been sprayed. They also are still refining the concentrations of the compound that they will use, and which parts of the plant it should come from. “We extracted the compound in its pure form from the plant, but we are curious to see which parts of the plant are most potent. We’ve tried the pods, leaves, roots, and so on,” Tseng explained. Once scientists have gathered the varying extracts, they will test them on the deer herd, as well as within their field trials. They will also compare them with commercial repellents. The field trials include soybean plots at two different sites, which have different concentrations of insects and deer. “We specifically chose one area with high-density deer populations, and another that has high rates of insect damage,” Tseng said. The researchers are using unmanned aerial vehicles (UAV), or drones to determine how much yield is lost. The UAVs take high-resolution images of the fields, which allow researchers to gather data on damage done by deer. While the prospect of an all-natural pest deterrent is an exciting one, both researchers say that perhaps the most exciting part of their experiment has been the interdepartmental collaboration. Lashley is also a research scientist in the university’s Forest and Wildlife Research Center. “We’ve been able to join two different bodies of knowledge and expertise into one research project. We have Dr. Tseng’s chemical expertise and access to a lab, and my knowledge of deer and access to the deer herd. It’s a true example of collaboration at its best,” Lashley said.